Why Did The Dash Light With Squiggly Lines Come On And What Does It Mean? The TCS is vitally important to your safety and should be diagnosed and repaired by a Good Mechanic who will run a Diagnostic Scan to pinpoint the problem. If you need a Good Mechanic Near Me, please give us a call. We offer a 2 Year/24,000 Mile Warranty and treat every car we work on as if it were our own. Our goal is to keep you safe and on the road. Why is my Car Running Rough and the Check Engine Light Flashing? Sometimes it’s because your Spark Plugs are Worn Out. Most car makers have a recommended mileage for Replacing Spark Plugs, but with the Stop-And-Go Driving Conditions and traffic backups in the Baltimore-DC area, it's more about time than mileage. Many 8-10 year-old cars have not hit the manufacturer’s recommended mileage yet; but Worn Plugs are causing Ignition Coils and Ignition Modules to fail. Replacing Spark Plugs based on time instead of mileage can save you a lot of money in the long run and keep your car running like it should be. If you are having Check Engine Light or other Car Problems, we will be happy to help you. We treat every car we work on with the same care as if it were our own vehicle. Our goal is to keep you safe and on the road. Does my Car Need Coolant In Winter? Your Car’s Cooling System (Water Pump, Hoses, Radiator, Thermostat, Heater Core) needs service year-round, regardless of the weather. In winter, the Coolant/Antifreeze lowers the freezing point and prevents freeze up, which could Crack an Engine Block. The Coolant also contains anticorrosion agents which prevent scale and lime build up in the Radiator and Heater Core, which is essential to keeping your passengers warm. It’s very important to make sure the Cooling System is in good working order for winter driving. We’re offering our Cooling System Service Special for $59.99 through 3/1/19. This includes one gallon of ethylene glycol Antifreeze, Pressure Test of system, Inspect Hoses, Tighten Connections, Drain & Fill Radiator. How Should I Prepare My Car For Winter Driving? No one wants their car to break down in any season, but especially not in cold or snowy winter weather. Visit a Good Mechanic and have your vehicle checked thoroughly for Leaks, badly Worn Hoses, or other needed parts, repairs, and replacements. Get any Routine Maintenance that may be due. We recommend getting our Vehicle Health Report so that you will know ahead of time what could cause your Car to Break Down or cause additional damage to your vehicle. We will identify problem areas and prioritize them to fit your needs and your budget. 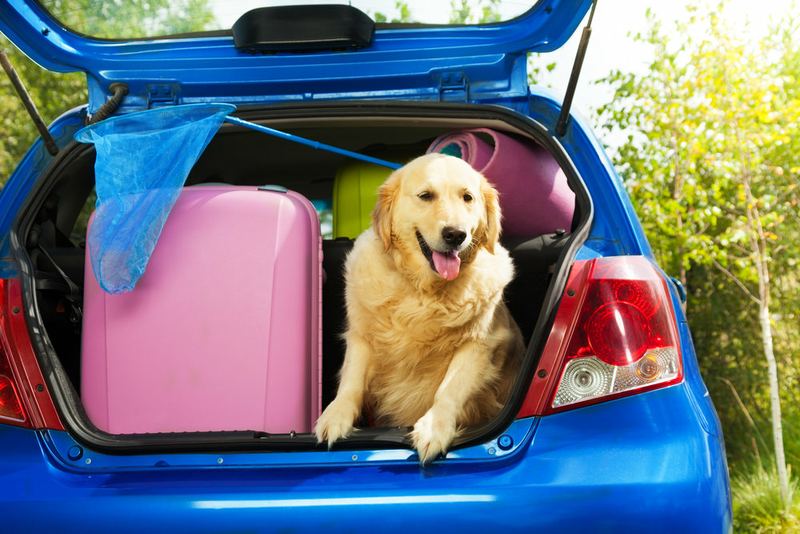 Keeping your vehicle safe and dependable for you, your family and everyone else on the road is our job. Do I need a Power Steering System Flush? If you hear Noise When You Turn the Car’s Wheel or if your Steering Is Jerky or Erratic, you should certainly get your Power Steering System checked by a Good Mechanic. Also, if your Power Steering Fluid is 3 years or older, it should probably be replaced. The Power Steering System helps to turn your wheels at low speeds. As you drive, bits of plastic, rubber, and metal from inside the system will wear off over time. There is no filter in the Power Steering System, so the only way to remove these particles is to Flush the Power Steering Fluid and replace it with new, clean fluid. Plus it will save you money in the long run. A Power Steering System Flush with BG products is 199.99 for most American and Asian cars and light trucks compared to over $500 to Replace a Power Steering Pump Assembly and over $900 to Replace a Rack & Pinion Assembly. It’s important to address problems with Power Steering as soon as possible to prevent bigger and more expensive repairs down the road. We treat every car we work on with the same care as if it were our own vehicle. Our goal is to keep you safe and on the road. Do I Need To Warm My Car Up Before Driving in Cold Weather? No. There is no need to Warm Your Car Up before driving unless you want a warm interior when you get in. Warming your car up is a waste of gas and actually terrible for your engine. The computer system in your car is designed to start the car and warm it up as quickly as possible, for fuel economy and emission, most cars warm up quicker when being driven not just idling. If you need to Defrost your Windshield, a simple homemade solution in a spray bottle will do the trick: Combine 1/3 cup of water and 2/3 cup of rubbing alcohol. Spray onto your windshield and watch the ice melt immediately. This works because rubbing alcohol has a freezing point 128 degrees below zero. Should you Rock your Vehicle when it is Stuck On Snow or Ice? Modern Transmissions do not have gears or speeds like many think; they use a Transmission Computer to up shift and down based on inputs from different sensors. When you Rock your Vehicle back and forth, the internal components can’t stop turning fast enough. This makes the Transmission Overheat very quickly causing the fluid to break down. Servicing your Transmission at the recommended intervals (or sooner if the fluid is discolored), could save thousands of dollars in costly Transmission Replacement. If you’re looking for a Transmission Service Near Me, we will be happy to help you. We treat every car we work on with the same care as if it were our own vehicle. Our goal is to keep you safe and on the road. Is a Brake Fluid Flush Really Necessary? People sometimes forget that maintaining your vehicle is always cheaper than repairing it. A perfect example is Flushing the Brake Fluid which costs about $169 for most vehicles, but replacing an Anti-Lock Brake Pump Assembly could cost $3500 - $6800 depending on the vehicle. Replacing the Brake Pump Assembly requires Bleeding the Brake System as part of the repair procedure. So the Brake Fluid is Flushed at that point, but at a much greater expense than just doing the Brake Fluid Flush as maintenance. If you’re looking for a Brake Fluid Flush Near Me, we will be happy to help you. We treat every car we work on with the same care as if it were our own vehicle. Our goal is to keep you safe and on the road. Snow is Coming; What’s More Important: A Safe Car or Bread, Milk, & Toilet Paper ? With a storm coming Thursday into Friday, and more bad weather this weekend, it looks like this will be a bad winter for the people and the cars of Maryland. But why does everyone worry about milk, bread, toilet paper before a snow storm, but not their cars? We see more No Starts or Slow Cranking and No Heat problems AFTER it snows, but not before. It’s hard after the holidays to find money to spend on your car, but if you wait until your car Won’t Start, you could miss more work. What about when you have No Heat, the Windows Will Not Defrost, and you have an accident because your visibility is reduced. Have you saved anything? We recommend getting a Vehicle Health Report so that you will know ahead of time what could cause you to Break Down or cause additional damage to your vehicle. We will identify problem areas and prioritize them to fit your needs and your budget. For a limited time, we are offering a FREE Basic Oil Change (up to 5 quarts 5W20 or 5W30 oil, filter, lube as needed) when you get a Vehicle Health Report for $45.99. We are happy that Confident Financial Solutions (CFS) will be providing extra Holiday Cash to our customers. 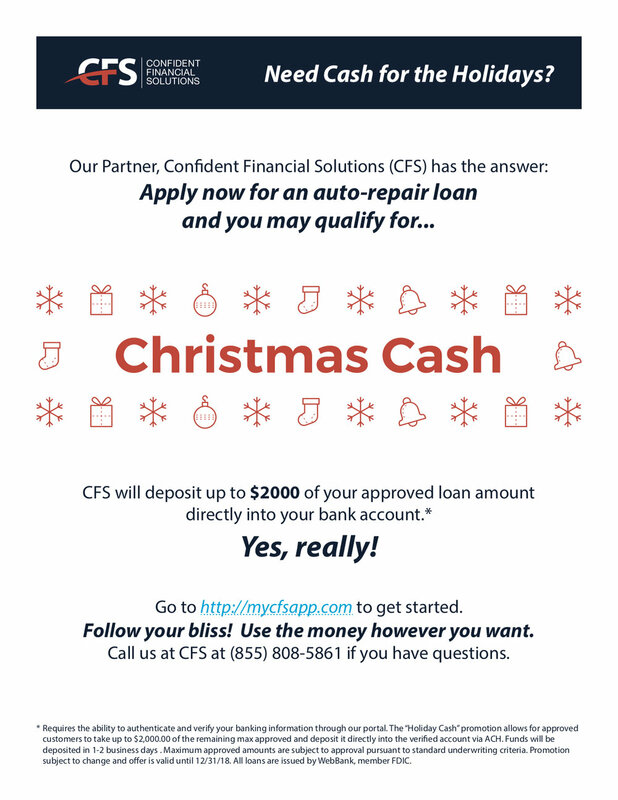 CFS will deposit up to $2,000 of your maximum approved amount directly into your bank account. Because who doesn't need a little extra spending money for the holidays? Customers can spend this money however they choose. Pour yourself a cup of hot chocolate. Start wrapping those presents. Come in today for more details. What are the symptoms of Blown Struts? Struts work to keep vehicle tires flat on the ground on a variety of road conditions. Blown Struts lose the ability to keep downward pressure on the Tires. After hitting a small hole or bump in the road, the Tire will rebound upward. When the Strut is blown, the Tire will not return to the ground immediately. This can cause the Tire Tread to skip or scuff over the road’s surface resulting in small cup-shaped depressions in the Tire Tread. Fluid Leakage is another symptom. The photo shows the Blown Front Strut of a 2014 Jeep Cherokee which was brought in because the owner found Oil Leaking on the driveway. Leaks indicate the Strut Cylinder has lost its Hydraulic Oil. We check Tire Wear and Suspension Parts whenever the car is on a lift for an Oil Change or any other service. This way if a Tire Wear Pattern is visible, it can be corrected immediately. We treat every car we work on with the same care as if it were our own vehicle. Our goal is to keep you safe and on the road.